As I mentioned in an earlier post, risotto is on my “bucket list” of foods to make someday. My husband wanted me to help because he takes my posts seriously but I had to remind him that some day means a weekend or upon retirement! In my defense, I was pretty exhausted last night. So my husband was on his own as he whipped up this delicious risotto with swiss chard. I don’t feel like writing out an entire recipe but the steps are similar to the risotto with taleggio and bacon, only you sauté the swiss chard first. If you haven’t made swiss chard, or bietole, one of the staples of your diet, you should give it a try. It’s a dark leafy green vegetable that has its own unique rich flavor and is also full of health benefits. Swiss chard is an excellent source for vitamin K, vitamin A, vitamin C, magnesium, manganese, potassium, iron, vitamin E, dietary fiber, and much more. It’s nice to come home to the smell of bechamel and red sauce. Last night, I came home late and found my husband in full cooking action. One large pot had a mixture of steamed cauliflower, cooked pasta, capers, peperoncino, olives and possibly onions in a red sauce. In another pot, bechamel sauce was bubbling. There was also a delicious looking pizza with bell peppers, onion and brie, but I didn’t try it because I had eaten earlier. This was the mid-way point of a baked pasta dish we’ve dubbed “sicilian” for its red sauce and spicy flavor. The two sauces are mixed together and then poured into a deep pan that is lined with breadcrumbs. For the full recipe, click here. If you’re not a fan of cauliflower, you can omit it and increase the pasta portions. Yes, this dish takes time but it lasts at least 3 – 4 nights! You know a recipe qualifies as simple when you can throw this together while still dressed in work clothes after a long day in the office. My husband and I were both tired. We had dinner but nothing that I could bring for lunch. So I quickly sautéd a sliced yellow onion and sliced red bell peppers in a skillet (yellow onions first, let it sweat a bit, then add bell peppers, using extra virgin olive oil of course, salt and fajita seasoning to taste). In the meantime, I cracked 4 eggs, added Cotija cheese and fresh black pepper, and whipped it until everything was mixed well. When the onions and bell peppers were cooked, I added in the mixture and let it sit for a few minutes (until the bottom should be cooked). While the top was still a bit runny, I put it in the oven on Broil to cook the top. That was it! In about 30 minutes, I was done and had two slices of frittata for lunch (heated for 45 seconds in the microwave). Please Save My Red Sauce! While not nearly as bad as the uncooked chicken episode of years ago, last night I undercooked eggplant and onions that were intended to be the base for a red sauce. This means that instead of flavorful eggplant and sweet-tasting onions, you get boiled vegetables that add zero flavor to the final product. Last night, my husband started the rescue process. Let’s hope he succeeds so that I didn’t waste the normally delicious Italian eggplants and two cans of plum tomatoes. Update: Okay, the red sauce was ‘saved’ with more peperoncini, some sugar, white wine and just cooking the hell out of it. After hours of cooking, the sauce had a nice, rich texture and the eggplant and onions were fine. Next time I have to be more patient! My husband is trying to save time for both of us by making good, filling dishes that last several days and are also good for lunch. Of course the first consideration is always taste. 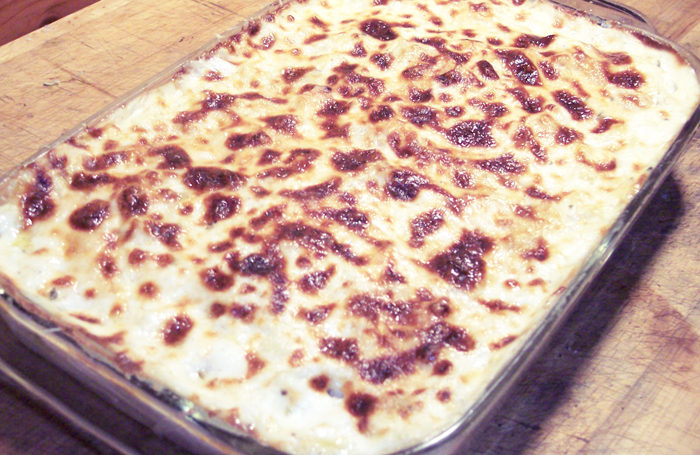 Although this recipe is fairly easy for my husband, I have never tried my hand at making bechamel/mornay sauce. I encourage you to try it though because it is a key ingredient. Substituting the sauce with cheese, even excellent ones for melting, is not the same. We had so much cauliflower and pasta that my husband decided to make a second, different recipe out of the same primary ingredients. 1 ) Steam or boil the cauliflower. 2 ) Cook the rotini pasta according to direction. Drain. 3 ) Roughly chop the steamed caulifower and toss with the pasta and peas in a large bowl. 4) Add grated Parmigiano or Cotija cheese and mix well. 5 ) Season with extra virgin olive oil, salt and pepper. 6 ) Add 2/3 uncooked eggs and mix well. 7 ) Scoop the ingredients into a large baking pan, creating one layer. 9 ) Pour the Sauce Mornay on top of the Pasta/Cauliflower/Peas mixture. 10 ) Add another layer of the cauliflower and pasta mixture. Pour on another layer of the sauce mornay on top. 11 ) Bake for approximately 20 – 25 minutes at 350 degrees, OR until the top is slightly browned. For the Second recipe, use the remaining or leftover mixture. 12 ) Add the plum tomato sauce into the cauliflower and pasta mixture. 13 ) Add the capers, black olives, 1 crushed peperoncino and chopped anchovy fillets and mix all the ingredients well. 14 ) As with the first recipe, pour into a baking pan and sprinkle bread crumbs on top. 15 ) Bake for approximately 25 minutes at 350 degrees. Let it sit before serving. This is important because the flavors come together once it cools down. It also makes a great lunch because it tastes just as good when reheated. We’ve been eating these two dishes for 3 nights, plus 2 lunches, yet it never feels like leftovers. Spinach and Potato Torta Tonight! I know that I’ve written several torta recipes during the short life of this blog. Since the principles are the same, I’ll just refer readers to earlier posts like this or that for recipe details. There are so many good things about tortas. They’re relatively simple to make. They taste even better the next day. They’re inexpensive, versatile, and pretty healthy too. These past 2 – 3 weeks, we’ve made 3 varieties of torta: one with zucchini, ham and olives; one with broccoli-cauliflower and curry, and a third one with spinach and potatoes. In both versions, there is a healthy amount of cotija or parmigiano cheese, 2 – 3 eggs depending on preferred consistency, salt and pepper. To make each torta last three nights and for variety, we usually make a side salad — something simple like cannellini beans with red onions and tomatoes or sauted artichoke hearts with fresh market cheese (something I picked up from an Armenian market). To the surprise of most, we rarely eat red sauce in the Oil and Garlic household. Food blog readers may not be that surprised but most people I know equate Italian food with lots of pasta drenched in red sauce and don’t know about regional food differences. It’s not that we don’t like red sauces but we haven’t found any exceptional store-bought version. Plus it’s so easy to top pasta in other ways — with tuna; pecorino and olive oil; peperoncino; garlic and oil, and so on. Since there are few ingredients, try to use the best possible tomato sauce you can find, ideally “pomodori pelati San Marzano” (San Marzano plum peeled tomatoes in tomato juice) from the Campania region (Naples or Salerno province). 1 ) Chop and sauté the onions in a deep pot. When the onions are almost done, add in sliced garlic cloves. It is important not to overcook the garlic because it will get bitter and overwhelm the sauce. 2 ) Pour the tomato sauce into the same pot as the onions and garlic. While simmering, add some red wine, salt and chopped basil. Add in a teaspoon of sugar. 3 ) Let it simmer for at least 1 hour. 4 ) When sauce is close to ready, boil a pot of water and cook pasta as directed on the packaging. Serve sauce over pasta and grated parmigano as the finishing touch. If you make a big batch, you can enjoy for at least 2 nights over your favorite pasta. My husband would also add that the right sauce/spaghetti ratio is just enough sauce to coat the pasta well but not so much that there is a ton of sauce left at the bottom of your plate when you have finished eating. In other words, don’t drench it!